A construction worker suffered burns to his face after a gas line was accidentally severed and started spewing flames at a downtown Victoria building. 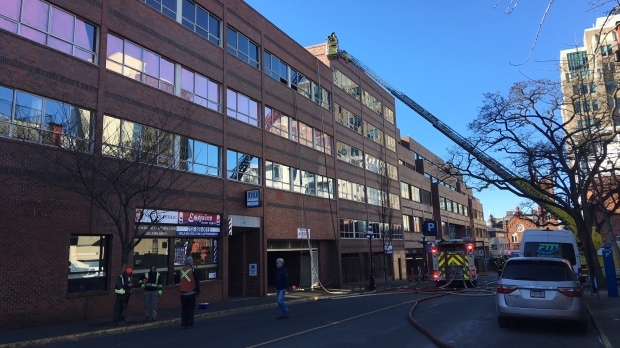 Firefighters were called to 940 Blanshard Street, the same building that houses the central branch of the Greater Victoria Public Library and various government agencies, late Wednesday morning for a report of a fire. A construction crew was performing work on the east end of the building when a worker cut the gas line, causing the fire, according to Victoria's fire chief. Crews were able to quickly knock down the flames and contained the damage to a small area. A ladder truck was also deployed to hose down the flames from above. It's unclear how severe the injuries to the worker were, but he could be seen receiving treatment outside of the building. The building was evacuated, with an estimated 1,000 people spilling outside as crews fought the flames. They shut down Broughton Street between Blanshard Avenue and Douglas Street.